If you’re looking for the best value in an ergonomic office chair, Office Star produces an adjustable, comfortable, and well-priced option that is hard to beat. With ergonomic features and adjustable options, this chair earns praise for its comfort and affordability. Featuring a ProGrid mesh back, you’ll get lumbar support and breathability. The FreeFlex seat has a sliding adjustment to get the cushioned seat in just the right spot. You can also adjust the seat height, arm height, and seat tilt with one-touch pressurized controls. Some chairs require you to adjust tension by means of a knob placed in an awkward spot, but this chair from Office Star makes it easy to modify settings. This chair is also certified for low chemical emissions, adding to its value if you’re concerned about air quality or are sensitive to chemical odors. Users find the chair to be supportive, sturdy and durable. In real-life action, it may at first seem to lack as much lumbar support as some other models of ergonomic office chairs, but it has been widely noted that adjusting some of the other settings alleviates lower back strain. Choose this chair by Office Star if you’re looking for a reasonably-priced office chair that will be comfortable and supportive. If a headrest is on your wish list for an ergonomic office chair, look no further than the Topsky Mesh Computer Chair. This mesh seating option offers breathability, and a headrest for extra head and neck support. It also has the ergonomic features necessary to earn it a place on our list of top picks. In addition to the two-way adjustable headrest, the chair also has an adjustable lumbar support cushion. Those who suffer from lower back pain will appreciate the extra support. Additionally, the height of the arm rests is adjustable, so you can find the perfect spot. Choose the Topsky Mesh Computer chair if you’re looking for a well-made office chair that can support your head and neck during long days at the office or intense projects at a mid-range price point. When you’re looking for the ultimate in comfort, look to La-Z-Boy to bring you the Delano Big & Tall Executive Leather office chair. This office chair integrates ergonomic design and memory foam to produce office seating that is as comfortable as it looks, and can stand the test of time. Produced in a rich chestnut color, the bonded leather seat features layered body pillows to provide back support and seating comfort that lasts for hours. The seat itself has five layers of foam, including strategically placed memory foam to provide cushion and support. The waterfall seat design promotes circulation in the legs. This ergonomic office chair is also a great choice for taller individuals or those with a larger frame. Constructed with commercial grade components, this chair has been rated to hold up to 400 pounds and passes BIFMA industry-testing standards for durability. The Delano by La-Z-Boy just may become your favorite seat of all, even if you do have to do real work while sitting in it! If you’re looking for a top level ergonomic office chair, look no further than the Herman Miller Executive Aeron Task chair. This high-end office chair is a considerable leap in terms of price point from other chairs on our list, but there is no shortage of science and features to support the cost. Herman Miller has a reputation for using in-depth research and top-notch engineering to produce quality chairs that will stand the test of time. 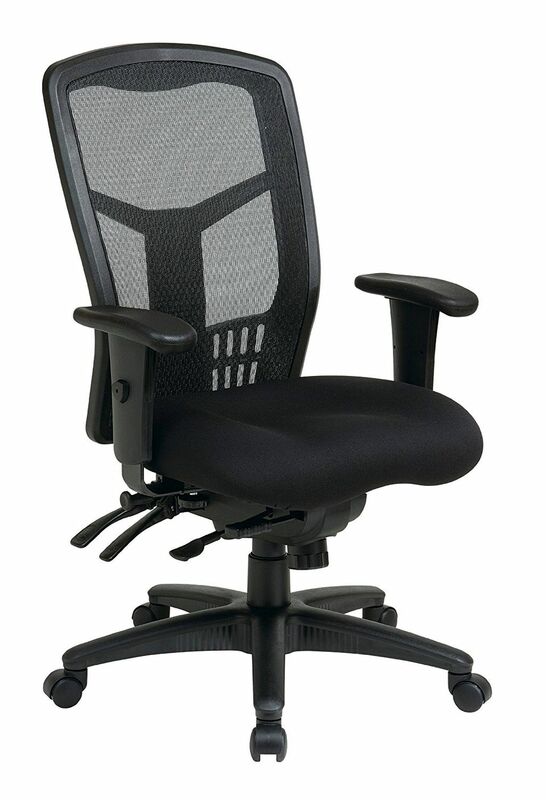 The Executive Aeron task chair features a Pellicle seat and backrest, which provides breathability. It also has leather armrests for a polished finish, and is available in a variety of sizes. Two stand-out features that make this chair worth the investment are its Kinemat tilt system and PostureFit mechanism. These engineering differences allow for proper alignment and tilt of the neck, shoulders, hips, pelvis, knees, and ankles. Unlike other office chairs which may restrict your seating position or cause tension points, Herman Miller has given vital attention to the human anatomy when designing this chair. This ergonomic office chair is the perfect choice for individuals who want the highest level of comfort when spending long hours at a desk. It also is a top pick for people with neck concerns, back problems, or other conditions exacerbated by sitting. Perhaps as an indicator of the relationship you’ll begin with this chair, each Herman Miller product features a sticker with its production date, cleverly marked as ‘Born On.’ You may love this chair so much that you celebrate every year of use that passes by. Pick this office chair, and you’ll also receive a 12-year warranty backing the workmanship. A unique option in our round-up of the top ergonomic office chairs is this model from Yamasoro. This bonded leather office chair is the only one to make our list that features actual spring coils in the seat. Just like the springs in a mattress provide support and comfort, the seat of the High Back Executive Office Chair has built-in spring support combined with foam. Users report that the seat is extremely comfortable, even when seated for an extended period of time. Additionally, the arm rests can be flipped up and out of the way of the seat, making the chair more versatile. If you’re concerned about the longevity of a standard cushion seat, choose the Yamasoro and experience the comfort of a seat supported by springs. The High Back Executive Office Chair is backed by a 5-year workmanship warranty. The Perfect Posture Delux Task Chair is a great choice if you’re looking for a simple ergonomic office chair on a budget. The chair features an ergonomic design, and a variety of settings to support your perfect posture. While the chair itself is basic in appearance, it hits all the marks to be our best ergonomic office chair on a budget. Built-in lumbar support is the start of this chair’s ergonomic features. It also features a waterfall seat, that naturally reduces strain on the legs. To find your perfect posture, you can also adjust the arm height (adjustable arm model only), back height and seat height. It’s easy to assemble and can be ordered with a variety of arm options or upholstery colors. It should be noted, however, that this chair may prove to be less comfortable for individuals who are very tall or prefer a wider seat. If you’re looking for an office chair in a color other than standard black or brown, check out the Modway Articulate Office Chair. This mesh and plastic chair offers ergonomic design in seven color options, including a cheery yellow and rosy red. For an ergonomic office chair, the Modway offers passive lumbar support, two-way tilt (which allows you to separately adjust the back and seat), and adjustable height armrests. The Modway makes a great choice for those who are concerned with comfort and color in the office. You’ll get the benefits of ergonomic design, and also have the flexibility to choose a chair that appeals to your sense of style or matches the décor of your office. We bought two top-rated ergonomic office chairs and our reviewers tested them for 90 hours. We asked our testers to consider the most important features when using these ergonomic chairs, from their lumbar support to their adjustability. We’ve outlined the key points here so that you, too, know what to look for when shopping. Seat Look for a seat that has plenty of padding and is made with breathable fabric. The height (16 to 21 inches is standard), as well as the width and depth (17 to 20 inches is standard), should be adjustable. The seat should also swivel easily for complete mobility without straining. Lumbar support Lumbar support — or lower back support — is one of the most important features, especially if you’re at your desk for long periods of time. To ensure that your chair properly aligns with the inward curve of your lower back, choose one that can be adjusted both in height and depth. Backrest Ergonomic chairs come with two different types of backrests: those that are connected to the chair and those that are separate. If it’s connected to the chair, make sure it adjusts forward and back. If it’s separate, both the height and the angle should be adjustable. Either way, look for a chair that has a backrest between 12 and 19 inches tall.